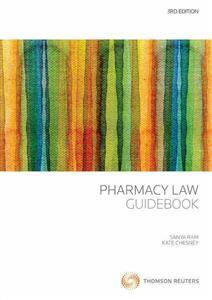 The Pharmacy Law Guidebook 3rd edition brings together the relevant legislation and codes that regulate medicine and the pharmacy profession and traverses the protections afforded to patients. The Guidebook contains thematically grouped excerpts from key legislation. Each subject is divided by chapter and clearly structured with labels and headings. The new edition updates and consolidates amendments to the expertly prepared selection of legislation extracts and supporting material, with additional commentary. It also features a list of defined terms from four key pieces of legislation as an Appendix.